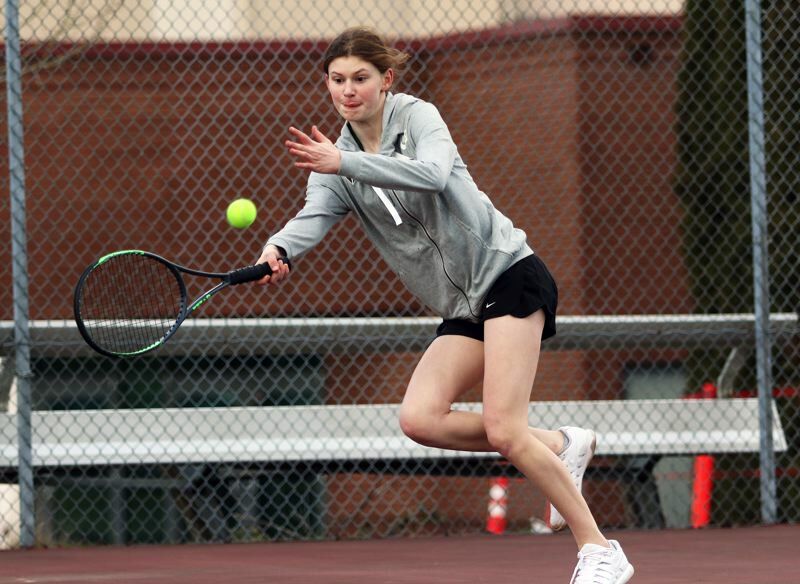 TIGARD — The Tigard High School girls tennis team has a new look to it this season, and the Tigers will be looking to keep getting better as the season goes on. "We lost half of our varsity team from last year, so we're looking to get lots of good experience for our younger players," Tigard coach Kelsey Wahl said. Tigard will be playing this season without two-time defending Class 6A singles state champion Lizzy Stephens, who opted not to play high school tennis this year. But the Tigers still have a top returning doubles combination in their No. 1 team of sophomore Ali Dreves and senior Nicole Mazzeo. Last year, Dreves and Mazzeo, in their first year playing together, reached the quarterfinal round of the Three Rivers League district tournament. "I have high hopes for Dreves and Mazzeo this season," Wahl said. "After coming close to qualifying for state last year, their goal is to place at districts." Dreves and Mazzeo are off to a 3-0 start in No. 1 doubles play in Three Rivers League matches so far this season. Included in those wins is a 4-6, 6-1, 7-6 victory over Lake Oswego's Rebecca Prasass and Julia Yazhari. Mazzeo and Leah Swanson are the only two seniors in Tigard's varsity lineup. "We have strong leadership from our two varsity seniors, Mazzeo and Swanson," Wahl said. "Those two, along with Ellie Dodson are our team captains this year and they have been doing an amazing job creating strong team unity." Junior Emma Parker takes over at the No. 1 singles spot for the Tigers. "She improves every single day and I think that the tough competition in our league will be a good motivator for her," Wahl said of Parker. Swanson will be playing at No. 2 singles for the Tigers. Dodson, a junior, will be at No. 3 singles and freshman Haley Cabrera will be at No. 4 singles. The team of sophomores Abby Gilliat and Emily Sverdrup will play at No. 2 doubles. Sophomore Sophia Freebury and junior Citlali Nieves Lira will play at No. 3 doubles and the team of junior Priscila Loza Orozco and sophomore Kennedy Peery will be at No. 4 doubles. Juniors Ellie Noyes, Riley Young and Selena Li will also see varsity action for Tigard. "We're looking forward to a fun and exciting season," Wahl said. The Tigers, who, as a team, are off to a 0-3 start in league matches, will be back in action on Monday, when they host Oregon City in a TRL contest starting at 4 p.m. On Wednesday, Tigard will be home to face West Linn at 4 p.m.